Navigate to view all orders -See Here for help on locating. Click on any order to see all details of the purchase. Here you can see: Billing and Shipping addresses, Payment option, Order date, Items ordered, and Total. Depending on the payment processor there will be notes on the order on the right sidebar, along with an option to make a note of your own. 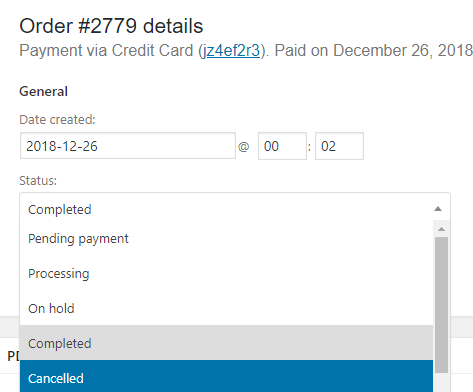 Pending Payment - First stage Automatic when an order is being filled by a customer. Processing - Second stage Automatic when an order is being run through your payment processor. Failed - Not one you can select but shows when payment could not be processed. Typically means that the customers' payment was declined. Completed - Third Stage Automatic when an order has been processed successfully. On Hold - Manual Stage Place an order on-hold for your records. Canceled - Canceled by the customer. Depending this may be automatic. Refunded - Manual Stage After refunding an order, update the status for your records here. See how to refund an order here!